During the season Ottawa as Cup champion played a challenge against Edmonton in addition to their regular schedule. They had played a challenge during the CHA season against Galt. Edmonton was champion of the Alberta Amateur Hockey Association. The 1910 NHA season was the first season of the National Hockey Association men's ice hockey league. The season started on January 5, but was suspended immediately and the league then absorbed the Ottawa and Shamrocks teams of the Canadian Hockey Association and the season continued from January 15 to March 15. Seven teams played 12 games each. The Ottawa Hockey Club played two Cup challenges during the season, but lost the Cup to their rivals the Montreal Wanderers who won the league championship and played a Cup challenge afterwards. 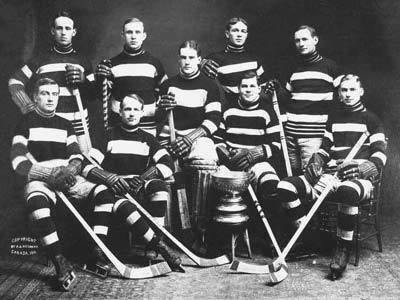 1909/10: After the professional Senators won the Stanley Cup, the era in which amateur teams fought for the Cup was over, as a professional league known as the Canadian Hockey Association was formed. However, the CHA would only last 2 games a stronger professional league National Hockey Association was starting up at the same time. In January the Senators would join the NHA, but not before fending off cup Stanley Cup challenges from the Galt Professionals and Edmonton Eskimos. Joining the NHA had to be a pitter pill to swallow for the Senators, who rejected the Montreal Wanderers entry into the CHA, which led to the Wanderers creating the NHA. Since it was agreed that the champs of the new NHA would win the Stanley Cup, the Sens had to give up Stanley Cup, after they finished in 2nd place with a 9-3 record behind the rival Wanderers.